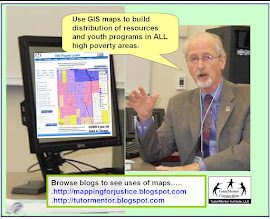 Most of the articles and graphics on this site use traditional maps, showing the Chicago region and places where volunteer-based tutor/mentor programs are needed. However, the Tutor/Mentor Connection has been creating many different types of maps, showing the ways people might get involved to help tutor/mentor programs grow, or the range of information we host on our web sites to support involvement by an infinity of people and organizations. This graphic is from a Trailmeme web site that enables visitors to map the path they take through the internet to discover information. In this case, a volunteer from the UK has built a map showing a progression of places in the Tutor/Mentor Connection library that she has located, and which she is sharing to help others follow and learn more about the T/MC and its resources. When you go to this site, double click on each graphic and see how it points to a section and/or article on the T/MC web site. For instance, when you double click on "where to start" you go to this page. See more uses of maps and graphics on this site. I'm Dan Bassill, President of the Tutor/Mentor Connection. I'm guest writing articles on the Mapping for Justice blog while we look for financial support to add a part time map-maker back onto our staff. 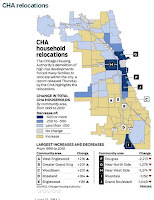 This map was part of a Chicago Tribune story from Friday, April 15, 2011 that you can read here. The dark blue areas are the former locations of Cabrini Green, Henry Horner and Rober Taylor CHA high rises. 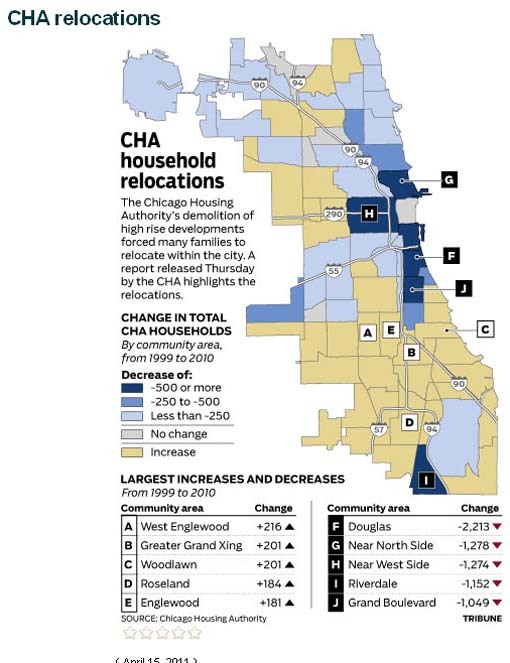 It shows that the neighborhoods receiving the largest number of displaced residents are in Englewood, Greater Grand Crossing, Woodlawn, Roseland and Englewood. If you view some of the maps we've created, or use the Interactive Chicago Tutor/Mentor Program Locator to create your own map, you'll see that these are neighborhoods with high poverty, high numbers of homicides, large numbers of poorly performing schools, and very few mentor-rich non-school tutor/mentor programs. Our goal is to use this information to increase the number of volunteers and donors who help non-school tutor/mentor programs grow in high poverty areas. For us to do that we need philanthropic investors who will support our efforts so that we can keep this map-based resource available to Chicago and continue hosting May and November Leadership and Networking Conferences to help programs grow. I've created some videos that show the Tutor/Mentor Connection strategy. I hope you'll view them and show them to people who might support our efforts, and the efforts of tutor/mentor programs throughout the Chicago region. 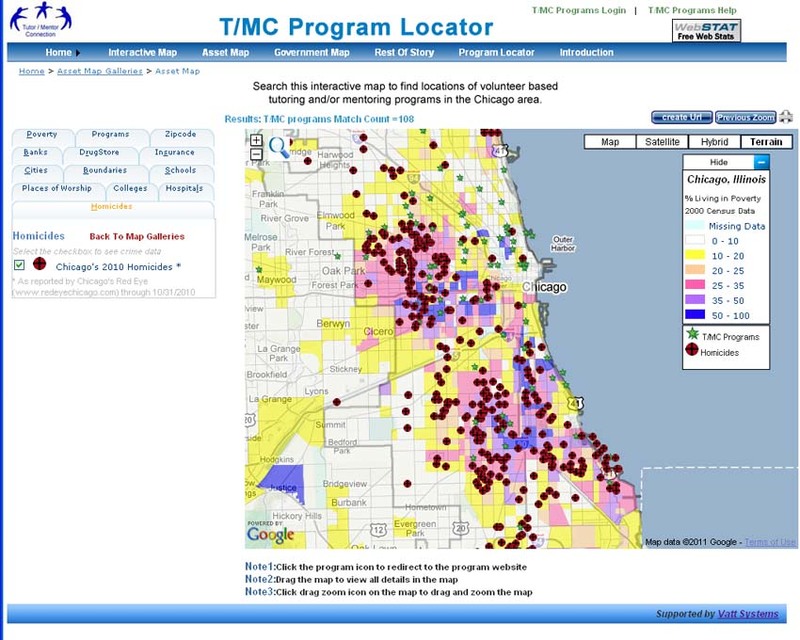 Mike Trakan added a new layer of information to the Interactive Chicago Tutor/Mentor Program Locator maps, showing 2010 homicides. This is a map created in just a few minutes, that I imported to Adobe Photoshop, then converted to a JPG and put in this article and one at the Tutor/Mentor Blog. Mike added this feature this week, even though he was laid off a week ago, due to lack of philanthropy donations to fund the Tutor/Mentor Connection and our mapping project. I hope you'll browse the articles Mike has written over the past three years and see how important his contribution has been to the T/MC and to helping volunteer-based tutor/mentor programs in Chicago get more visibility, and hopefully, more volunteers and operating resources. You can also visit the Map Gallery that Mike created to host the maps he has made. We were able to bring Mike on staff in January 2008 and rebuild our mapping capacity thanks to a $50,000 donation from an anonymous donor. That money ran out in mid 2009 so we've not been able to update the program locator or do some of the technology improvements we know need to be made. Until we can find new philanthropic investors to support the T/MC we seek volunteers who will help us maintain the map project, as they did between 2000 and 2008. If you can help just call 312-492-9614 or email Dan Bassill at tutormentor 2 at earthlink dot net. If you're looking to hire a really creative map-maker, Mike would be your man.